The Black Diamond Mondo lives up to its name—this is one big crash pad. It spans 44 by 65 inches when open and covers nearly 20 square feet of ground. Along with its spacious landing zone, the Mondo is five inches thick for the softest of impacts when you peel off that highball. In this size range, the Mondo has few peers. Like most pads, the Mondo’s core is constructed of two layers of foam, firm closed-cell on top of soft open-cell, but with the Mondo BD supersized both. The Mondo has a full inch of closed-cell PE foam on top of four inches of high-compression PU foam. With the previous version of the pad, some climbers complained that its foam tended to soften quickly. BD claims to have improved its composition, and after a spring, winter and fall of heavy use, my pad has kept its firmness. The Mondo’s cover is made from a tough 1000-denier nylon, which has a polyurethane coat on the inside for water resistance. I’ve been caught in spring rainstorms, and while the nylon surface wets out, water doesn’t appear to soak through to the foam, and the surface dries quickly. 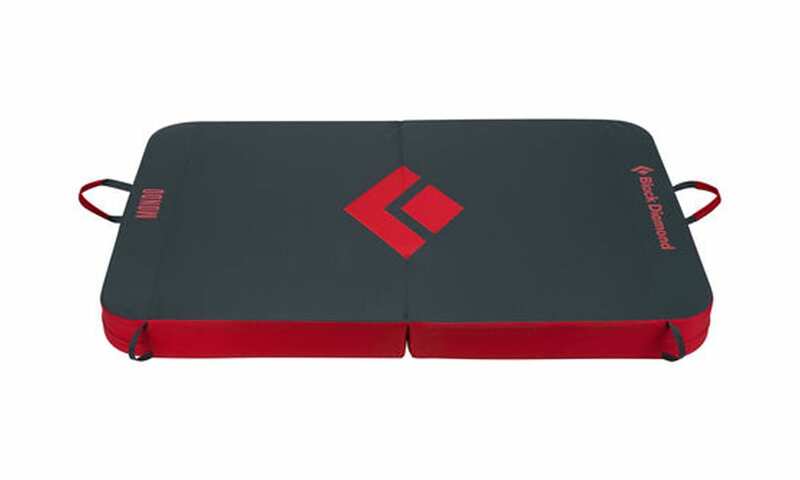 Furthermore, the bottom of the pad has a thin coat of rubber to prevent the pad from sliding around. The rubberized fabric also seems to repel water well on damp landings and picks up less dirt than nylon. When the bottom does get dirty, it’s easy to wipe down with a damp cloth before stuffing back in the car. I’ve dragged this pad around abrasive sandstone areas from Joe’s Valley, Utah to Redstone, Colorado to Roy, New Mexico and haven’t experienced any damage to the cover outside of normal wear-and-tear. 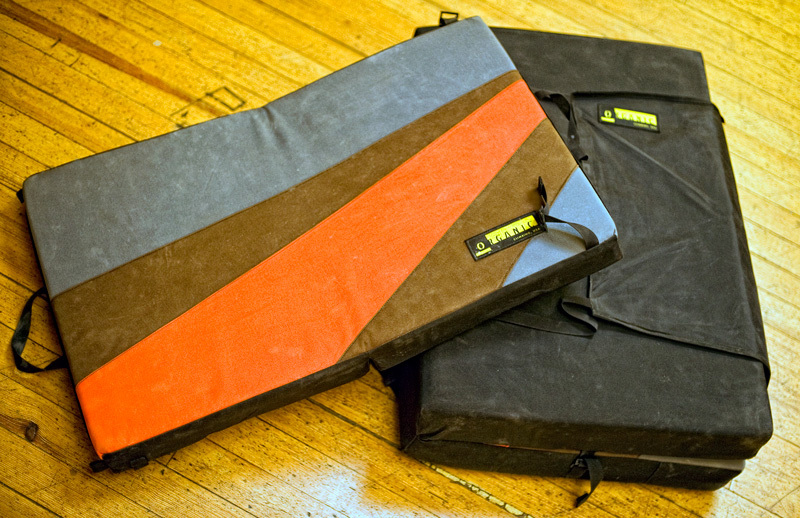 For gear stowage, the hinge-style pad, when folded, easily fits a small pack inside with room to spare. 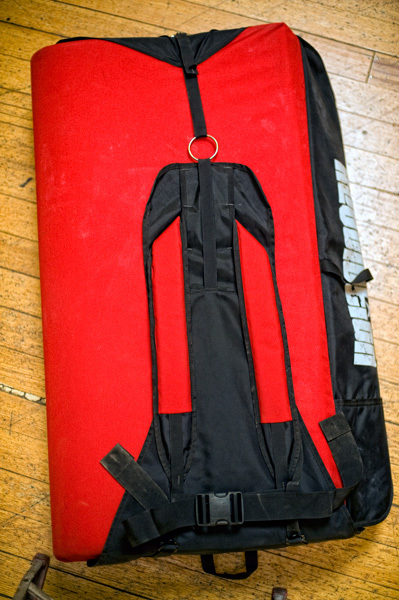 Its simple, three-strap closure system (two on the side, one on the bottom) cinches down tight enough to keep loose items—shoes, chalk bag, jacket, etc.—from slipping out. Each corner of the pad has a small grab loop for easy repositioning as a spotter. The pad also has two large “shoulder webbings,” as BD calls them, on either side so you can carry the pad (closed) like a massively oversized mail bag. These shoulder webbings, while handy for shuttling the pad short distances between problems—if you’re tall enough that the pad doesn’t drag on the ground—are annoying for just about everything else. The have a knack for snagging on all things pointy. Fortunately, they each have a little Velcro pouch to stow them away, but I find it easier to just fold them into the pad before packing up. The only major downside to the Mondo is that it’s a pain to hike with, especially for smaller climbers. The shoulder straps and waist belt of the suspension system, neither adjustable for height, were designed to fit a giant—or maybe 6’ 1” BD athlete Adam Ondra. I’m 5’ 9” and the waist belt crosses inches below my hips, making it useless. This forces non-giants to carry the load entirely on their shoulders, and the shoulder straps, while lightly padded, aren’t adequately cushioned for 20 pounds of pad plus gear over long hauls (read: chafing). Bottom line, you get what you ask for. The Mondo is a whole lot of pad. That means more weight and width to lug around, but with its five inches of foam and nearly 20 square feet of ground coverage, nothing will inspire more confidence for that tricky topout, highball or solo session. To me, that’s worth the extra effort.